As I stood at the sink, the smell of lime and sea salt dish detergent filled my nostrils. "I can do this thing," I thought. Elijah, standing beside me, was doing his best to help with the dishes. This basically meant he tried at every possible opportunity to get his hands in the sink and send water splashing to the ceiling in a fountain of gargantuan proportions. Here we stood for awhile, a mother and son. I can do this. Three pans left to wash and the sweet sound of a little one's cries filled the air. Oliver had awoken from his slumber in his pack n' play in the adjacent room. I let the water out of the sink lest Elijah washed the dishes without me, causing my cottage cheese ceiling to crumble. "Oh, Oliver is upset," I said to Elijah and I left my spot at the sink to comfort my youngest son while my eldest followed close behind. "Should we change his diaper?" I asked Elijah as I grabbed a diaper and wipes. Elijah stood at the edge of the pack n' play with a sly smirk on his face watching his little brother. I can do this, I thought again. Oliver was now clean and happy so I crouched down to Elijah's level and held little Oliver next to his big brother's face. Elijah leaned over and gave his baby brother a big sloppy kiss. My heart swelled so that it no longer fit in my chest and I thought, I'm doing this. It was noon and the three of us headed to the kitchen. I gave Elijah two choices for lunch. Holding each item in front of Elijah while juggling a baby, I asked, "Do you want chicken nuggets or a turkey sandwich?" Elijah looked at both boxes, smiled and slapped the chicken nuggets box. "Chicken nuggets?" I said, "Of course, chicken nuggets, what else would it be?" While prepping Eli's lunch, Oliver started to fuss and tried to latch onto my face. I had two hungry boys on my hands. How in the world am I going to do this? I helped Elijah get into his chair with my one free hand and made sure we had all of our necessary lunch items ready on the table. "You're the big brother, Elijah. Oliver is hungry too, so I need you to be patient and wait while I take care of your little brother," I said. Elijah, who is not known for his patience, sat in his chair and waited with a smile on his face, occasionally peering at the baby in my arms. I started nursing Oliver and then feeding Elijah with my free hand. "Nuggets, cherries, or coconut milk?" I asked, giving Elijah the choices that help him feel like he is in control of his own destiny, therefore reducing his temper tantrums. "Milk? Okay," I said and I tip the cup so that milk pours into his mouth, my pinky finger giving his chin support. This isn't easy, but I really am doing this. Edited to add: This was one of the first times I was left alone with the boys. I've been fortunate in that I've had a lot of help this first month, but now Andy is back at work. I'm linking to Just Write, where we're encouraged to...just write. Little chunk already weighs over 11 lbs. Oliver is three weeks old today. 21 days. A blink in time and a lifetime, it seems. 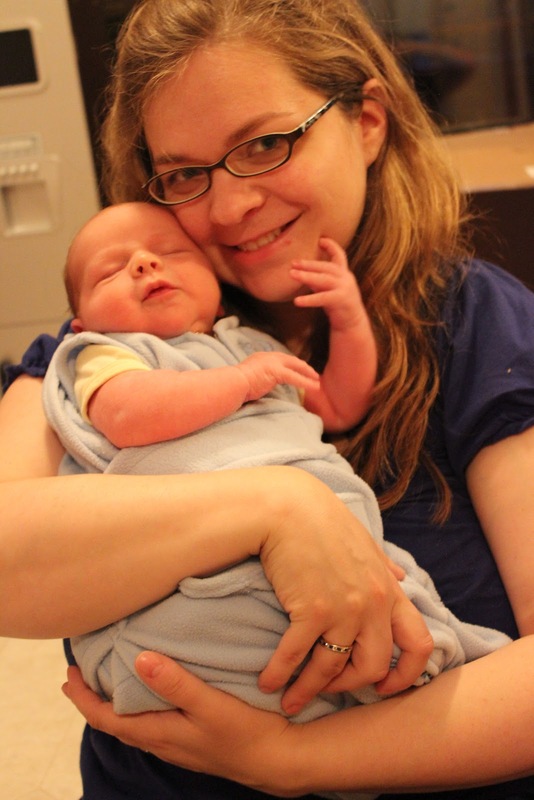 At three days old we hadn't held Elijah yet. We missed this snuggle time. Elijah was still on a ventilator at seven days. We missed the sound of sweet baby breaths. It took two weeks for Eli's voice to fill our ears. We missed these cries. Elijah wasn't home with us yet. We missed this time together. I didn't truly know what we had missed until now... we've gotten to experience what it's like to have a newborn at home within days, I now know what it's like to see our child at birth, to hold and nurse our baby as soon as possible, and to have a positive birth experience. These are things we missed with Elijah. And, yes, I grieve for him all over again. More than grief, though, is an overriding joy. I have looked at our newborn mesmerized by his sweetness and cried tears of joy. We are so blessed. Blessed to have Oliver home with us. Blessed that Elijah is alive and well. What has often been the case since Elijah's difficult birth is this - we don't, we can't - take things for granted. I've appreciated these experiences with Oliver so much more than I would have had we not gone through Elijah's first weeks. That in of itself is a blessing. There is pain in the memories as I grieve our first-born's lost weeks, but more than anything there is a joy in the here and now. Often times joy and grief are so intertwined that you can't see one without the other. As our hearts heal, we appreciate that we are not missing this life we have now. It's a life filled with lots of kisses for two boys that we love intensely and deeply. Looking back at what we've lost just makes us more determined to not miss a second of this amazing life.